Last winter I did only knit two pairs of mittens, my younger son took my Anemois, and the second pair, the Rosebud mittens, went to my daughter. 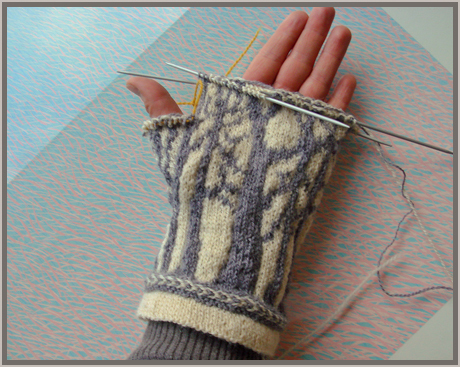 My intention was to start knit a pair of mittens for myself, but receiving the Deep in the Forest mittens pattern (by Tuulia Salmela), I realized my yarn would never stand 2,75 mm needles, and resigned to knit the mittens for my older daughter. I started to knit as soon as the Piccola marina socks were finished (they are now blocking), and realized very soon that mu gauge of some reason is totally off. I have knitted with this yarn and these needles a lot, but obviously the straight lines and my afraidness of stranding too tight on the backside led to a much looser knit than I usually do. Result: these mittens will be suitable for my older son, whose hands are just a tad smaller than my husband's. Good part: he needed new mittens too. Bad part: still no mittens for me. The mittens look very uneven on these pictures, but it comes from the straight lines, the colour change is on exactly same place row after row. They will even out when blocking. The braid was fun to knit, as always, and Tuulias description on how to do it is very straight forward and clear. I'm using Vuorelma's Satakieli yarn and 2,5 mm dpns. The only alteration I so far has done was to pick up the stitches for the thumb gusset from the grey, or contrast colour, yarn on the backside, not from the main colour yarn. I got visible stitches on the right side when using the mc, but that can of course have come from making some other mistake when picking up the stitches. Anyway, it's very neat now. And finally an update on the Ribby cardi: I have located two balls of grey in the right dye lot, and I'm waiting for them to be shipped to me. I have knitted the body and almost the entire first sleeve. As soon as the yarns arrive I'll continue. The Wabi Sabi scarf is a project I in fact started and finished back in April. Of some reason I haven't got around to take pictures of the scarf until now, perhaps because it's a very hot scarf. 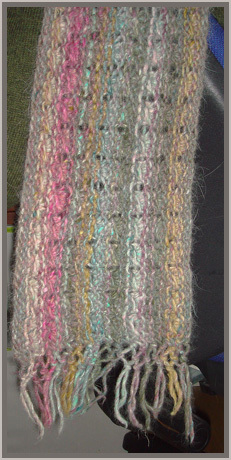 The Wabi Sabi scarf is knitted in lovely Noro Kochoran, shade 47 on 6 mm needles. 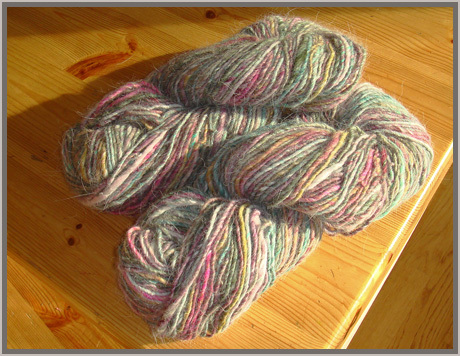 The yarn is a 10 ply aran weight of Wool, Silk and Angora. The pattern for the Wabi Sabi scarf is by Kamicha, and Kamicha is kind enough to give it out as a free pattern. Thank you Kamicha! The pattern repeat is only for rows, and very easy. An absolute extra is the beautiful knotted fringe. The scarf is knitted lengthwise, and you need a long, about 100 cm circular needle to manage the amount of stitches. The fringed is created at the end/beginning of the row every time you turn the work around. The scarf is long, about two meters, and I used about one and a half skein of Kochoran. It's a bit cloudy outside, so I talked Hanna into modeling the scarf inside instead, and she agreed, but was not overly enthusiastic in showing her modeling skills. Anyway, some kind of pictures of the finished scarf got taken. But what is not showing of very well is how the colours work in the scarf. 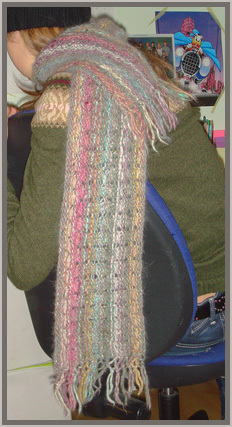 The idea is that there is not supposed to be any pooling, the scarf is about as long as one colour repeat of the yarn. I must have started a bit into the first colour, since I managed to get a small pooling effect in both ends of the scarf. It doesn't disturb me since it's symmetrically, and is quite beautiful. 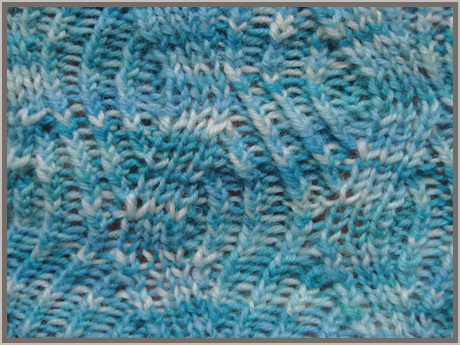 Still, it would have been nice to get the colour sequences right, but I had knitted quite a lot before I realized about the pooling. And Kochoran is pretty hairy, so I decided against ripping up it all. Here is a close up of the end and the fringe. Kamicha's pattern has instructions for both a shawl and a throw, or to be more exact, yarn amounts for those, since they are made by just knitting more repeats. I was a bit afraid the yarn would be itchy, but it turned out being very nice against the skin, and I have already have use for the scarf several times. We have got some kind of first feeling of the winter here in south Finland, with a couple of millimeters of snow on the ground and a couple of minus degrees. Lovely! Some months ago I started a new pair of socks. 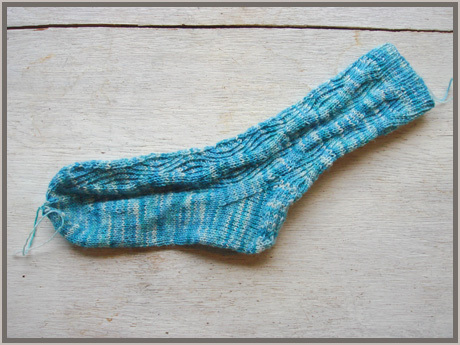 I have for some time, well actually since the pattern was published, admired Kate Gilbert's Marina Piccola socks. The inspiration for the socks is a small path down to a small harbour in Italy, and it reminds me of our holiday with the kids in north Italy a lot. I also had this lovely sea blue yarn, hand painted by VillaMokka (Mokkasukka 75 % wool, 25 % nylon). I had some problems grasping the graph for the pattern, I don't know why, since it's hardly ever a problem of mine. A slight problem was also that I did knit quite infrequently on the leg portion, and managed to forget the pattern in between. Fortunately, after having understood it, it usually took a row or two to get it again. Here is a close up of the winding path between the waves of the sea, a beautiful pattern I think. 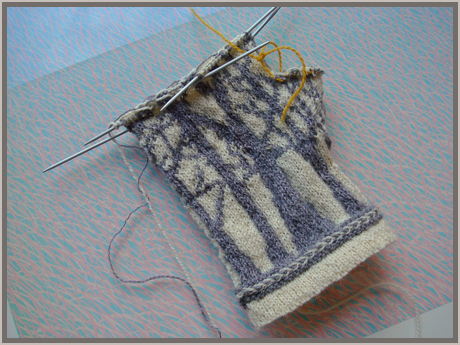 The cuff is knitted on 2 mm dpns, and the rest on 2,5 mm. Today I have promised to take my friend's son to his piano lesson, and I think I'll have plenty of time to set up the second sock while waiting for him. In fact, the foot part of the first sock was knitted in less than a week, so I think the second one will finish pretty smoothly too.